Homepage. 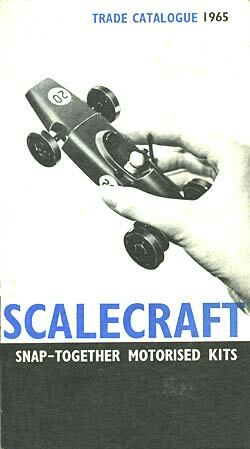 This page: Trade catalogue issued in 1965 by Scalecraft for their motor-powered cars, boats and aircraft. Motorised kits produced by Scalecraft. This small publication was printed in 1965, and issued to toy and model shops across the UK by Scalecraft Limited, of Twickenham in Middlesex. This catalogue dates to 1965, and features a motorised BRM racing car on the cardboard cover. Each kit contains all necessary parts, battery-powered electric motor, and full instructions. Moulded from high quality plastic, parts just snap together! Packs are bright and compact ... many in full colour. They make superb displays - preferably with a demonstration model. Only thing omitted is the battery. The only other piece of Scalecraft memorabilia I have is this box, for the snap-together Cooper racing car. It tells the lucky buyer that the kit was made in England, and the motor is 'Empire Made'. KIM Toys also has a logo on the box, perhaps for the motor. In 1965 these kits retailed for 5s 11d. Return to the motoring collectables page for more car-related memorabilia and collectables.